If the slick HD graphics and 3D capabilities of today's video games have you yearning for the blocky look and clunky movements of the games of yesteryear, you're going to love Super Mario Bros. Crossover. This Web-based version of your favorite Nintendo Entertainment System classic looks and sounds just like the Super Mario Bros. you remember from childhood. But playing this game comes with an added twist: You can do so using either Mario or one of several characters from other NES games you may have enjoyed. 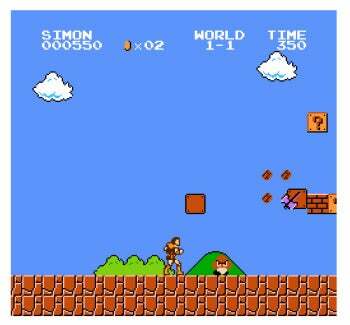 When using a character like Castlevania's Simon, you get access to their own tools, such as Simon's axe. Super Mario Bros. Crossover is available as an app in Google's Chrome Web store, where you can add it to your Chrome browser. The Flash-based game also runs in Internet Explorer and Firefox, as well. The game is free, but the site it runs on is heavily ad-supported. A few pop-ups managed to bypass my blocker, and I saw plenty of annoying animated ads. And, when I tried to enable the full-screen mode while playing in Chrome, the game itself was obscured by ads. I understand that the developer has to make money, and luckily it's easy enough to ignore the ads when you begin playing. To start, you select a difficulty level; options range from Super Easy to Extreme. You also select a game mode, which determines how many different characters you can use and when you can use them, and a character. Options include the original Mario, Link (from The Legend of Zelda), Mega Man, Simon Belmont (from Castlevania), and others. All of the characters operate the same way they do in their original games, and seeing them maneuver around Mario's world is pretty darn amusing. So, too, are the old-school graphics and music that the game offers. It's easy to forget how much a game can offer with such a simple design. Traveling through the Mushroom Kingdom trying to rescue Princess Toadstool is addictive as it was 20 years ago. Using your keyboard to destroy enemies and collect coins and mushrooms is not quite as intuitive as using your good old NES controller, but it doesn't take long to acclimate. I could do without all of the ads, especially those that feel the need to shake and flash. Without them, Super Mario Bros. Crossover could almost have me believing I was 13 years old again, playing Nintendo on a decidedly standard-def TV. And, yes, that is a good thing. Note: To play this game, you must follow the link and open it in a supported browser with Flash enabled. Then you can play the game online. A downloadable version is also available; PCWorld has not reviewed that version. Super Mario Bros Crossover lets you play the game the way you remember it, but with the option to add characters you might not expect to see. Looks and feels like the real Super Mario Bros.